Sweet Rowen Farmstead is a small, grass-based dairy milking around 25 cows in Vermont's Northeast Kingdom. They breed Randell Linebacks, an endangered heritage breed which came with some of the first white settlers from Scotland, and are therefore uniquely suited to our climate as they have evolved here longer than other breeds. The farm grows and harvests all their own hay, giving the milk a direct link to their working landscape. Providing the cows with a high quality of life is one of Sweet Rowen's founding principles. 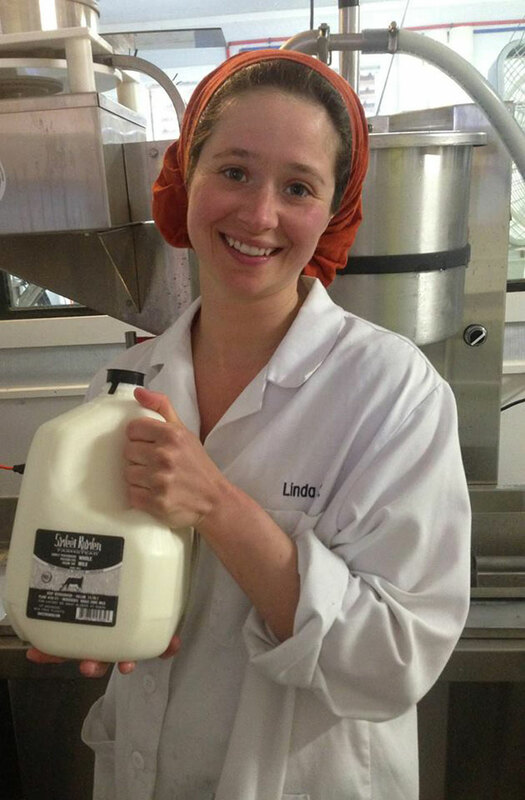 Sweet Rowen opened their own creamery in 2012, where they produce small-batch bottled milk and a variety of cheeses. The bottled milk comes in BPA-free plastic jugs produced in Yarmouth, ME. The milk is handled with great care and with as minimal manipulation as possible in efforts to retain the purity of the product. It is never homogenized or heated above the minimum pasteurization temperature legal by the current standards and is not heated to very high temperatures. The process of heating milk to high temperatures tends to break down the molecular structure of the milk, making it less digestible and less palatable than old fashioned milk. Sweet Rowen is proud to be bottling milk in small batches without the use of these large-scale practices. Sweet Rowen also produces a variety of cheeses including soft spreadable farmers cheese, an aged bloomy-rind “camembert” style cheese, a fresh cheddar cheese curd, and a soft, drained “chevre” style cheese rubbed in wood nettles. The Farmers cheese is packaged in 8 oz plastic tubs and come in five different flavors: lightly salted, sundried tomato and garlic, VT herbed, nettle and spicy Hot Farmer. The easiest way to explain this age-old product is as a simple, rustic, spreadable lactic cheese meant to be used in cooking or simply spread on a good piece of fresh crusty bread. It has been made for centuries and is still as popular as ever. It is a great “gateway” cheese for people who may not be ready for the stinky, rinded, funkier cheeses out there and is also a great family friendly cheese that kids and parents can all enjoy. The “Storm” and the “Mountain Ash” are our two bloomy-rind cheeses that are currently in production. The recipes are loosely based on a Camembert or Crottin style cheese. The bloomy-rind refers to the rind that develops due to the addition of a mold called Penicillium Candidum which creates a fluffy white exterior rind on the cheese while aging the internal tangy “lactic” curd. They are about 6 oz and wrapped in specialized cheese paper. The only difference between these two products is the vegetable ash that is dusted onto the young “Mountain Ash” before the rind develops to create a healthy habitat for the mould to grow and makes for an eye-catching little cheese. Both cheeses are earthy, tangy, and buttery with hints of grass, hay, and mushroom. You can find Sweet Rowen Farmstead milk and cheese in our Perishables cooler and our Cheese Department.